Translation of the church records of St. Jean the Evangelist of Port LaJoye, Ile St. Jean for the years 1749-1758. By Tim Hebert, webmaster of "Acadian-Cajun Genealogy & History", Tim Hebert. I have recently received a copy of this volume, and it will be an excellent tool for researchers. This is a new pulication and the book's web site has further details on its contents. Distributor: Nimbus Publishing, P.O. Box 9301, Stn. A, Halifax, N.S., B5K 5N5. Available At: May be ordered through most bookstores using ISBN number. "Acadia of the Maritimes" is a book by the Chaire d'études acadiennes of the Université de Moncton. Printed in 1995, it is similar to an earlier anthology produced in 1982 under the title of "The Acadians of the Maritimes". Since the original volume was published, an extraordinary number of new publications and scholarly articles have appeared, so it became necessary to provide a newer overview of the state of knowledge in the field of Acadian studies. The book is a collaborative effort, resulting in over 20 themes being addressed, ranging from "Acadia from 1604 to 1763: An Historical Synthesis" through the years until the present, and covering such diverse subjects as the Acadian Economy, Politics and the Acadians, Acadian Society, linguistic and cultural right of the Acadian people from 1713 to the present, French education in the Maritimes, traditional culture, the folklore, literature, art, and the music of the Acadians. It is not a history, per say, but an overview of life and its many phases, from the earliest days to the present. If you wish to understand the forces at work which shaped and moulded the lives of your Acadian ancestors, this book will lend greatly to your understanding. It contains a wealth of information about Acadian life, and should be on every Acadian researcher's wish list. Printer: Transcontinental Métrolitho, Sherbrooke, P.Q. For a number of years Summerside, P.E.I. was noted for two great eating establishments, locally known as "Andy's Sea Foods" and "Clovie's", named for their owners Andy and Clovie Perry, sons of Joseph and Mary Rose Perry who had moved from Mont Carmel to Summerside during World War One to find work. Heather Irving, daughter of Marie Cameron and granddaughter of Andy Perry, has recently published a delightful book of about one hundred pages entitled Andy's, in which she describes the intriguing, colorful life of how a poor French boy from a fishing family in Mont Carmel came up in the world through the era of Prohibition, first teaching himself how to read and write in English, riding the rails to work at the harvest excursions in Western Canada, and by rum- running. As Andy Perry's fortune improved he helped others, knowing what it was like first- hand to be poor. He built a business and employed many, was involved in sponsoring sports teams and horse racing events. He played poker, gambled and loved race horses. He ran for politics and was friends with senators, loved his family and took care of others. As his granddaughter put it, Andy Perry "did not measure life by what you had, but what you did with it. It's how he did his best to live." Heather Irving, in her Introduction, states that she wrote the book for her mother, who presently operates the popular Summerside restaurant known far and wide as "Gentleman Jim's", and to preserve the family's legacy in an era that is part of Prince Edward Island's historical past. The rich era known as Prohibition is part of that history and not to tell about it does a grave injustice to those who wish to understand the complexity of this colorful time. The book is easy to read, interesting, well illustrated, and has a biography of the author, endnotes and a list of resources. A great deal of interesting Island history is packed into the covers of Andy's. "A Brief History of Lyndale and Dundee, 1829-2000", researched and written by Margaret Campion with assistance from Harold MacLeod, and other great story tellers from the community, is an interesting history of the communities of Lyndale and Dundee, P.E.I. Published in the year 2000 for the reunion at Lyndale School, this book is an interesting collection of historical articles, student and patrons lists, letters, newspaper clippings, photographs and miscellany from the period 1829 to year 2000. Highly recommended for anyone researching this region of P.E.I. While sold out, this book may occasionally be found on some of the used book search engines and used book stores, and inter-library loans. Check out the used booksearch engines listed on the last page of this database! A Campbell Family Genealogy is a compilation of information on the Campbell's and associated families of Lots 51 - 59, and 61 of Prince Edward Island. The book is priced at $35.00 U.S. per copy. Packaging and mailing costs apply per copy, to Western U.S.A., $2.75 U.S., Eastern U.S.A., $3.50 U.S., and to Canada, please add $4.74 U.S.
2003 marks the 100th anniversary of the Exposition Agricole and Festival Acadien de la region Evangeline - formerly known as the Egmont Bay and Mont Carmel Exhibition. Among the special celebrations during this centennial included the production and launching of a book by noted Prince Edward Island Acadien writer and historian Georges Arsenault. This well-illustrated 86-page book, written in both French and English, tells of how the exhibition started and how it has grown to become what is now known as the Exposition Agricole and Festival Acadien de la region Evangeline. The first exhibition in this region was held in the Urbanville schoolyard on October 17, 1903 and was organized to serve as an educational organization, the purpose of which was the agricultural advancement of its members. In 1904 the exhibition grew to include the parish of Egmont Bay, and the following year the neighboring parish of Mont Carmel joined. From then on to the early 1970's the event became known as the Egmont Bay and Mont Carmel Exhibition. During the 1970's it was determined that the exhibition should also include Acadien music, dance and cultural activities. This resulted in the birth of the Acadien Festival - the first one being held August 27 - 29, 1971. From 1971 to now this yearly agricultural and cultural event has been getting better and better and is the pride and joy of the Evangeline area. Published with the assistance of the Acadian Cultural Development Program of the Department of Community and Cultural Affairs of Prince Edward Island, with translation provided by Daphne Davey, graphic design by Louise Daigle, this splendid little book may be ordered from L'Exposition agricole et le Festival acadien de la region Evangeline, P.O. Box 37, Wellington, P.E.I., C0B 2E0 for a cost of $15.00 plus postage and handling. Packed full of interesting information, illustrations, comments from the press, interviews, eyewitness accounts, extracts from minutes, this souvenir book brings to life the story of the oldest organization in the Island's Acadian community. Georges Arsenault is to be commended on writing CENT ANS DE SUCCES/A CENTURY OF SUCCESS. Across the Saltwater Bridge is fiction; however, the time, places and nearly all of the principal characters are real. Set in County Antrim, Ireland, during the first half of the nineteenth century, it relates the life and times of a working-class, Protestant family striving to succeed in a rapidly growing Belfast. The story opens with the aftermath of the battle of Antrim during the United Irishmen uprising of 1798 and continues until the time of the disastrous Potato Famine. Although the story of the Hamills of Antrim is fiction, its genesis is a skeleton of fond memories, fleshed out by genealogical research and finally dressed in the clothing of history. It is often said that the Irish, deeply rooted in their ancient Celtic origins, are among the worlds best storytellers. So says author, Arthur R. Hamill, and he should know as he is one of them. "A Doyle Family of Prince Edward Island", by Louis J. Daley traces the history of his ancestor, James Doyle, County Wexford, Ireland, to P.E.I., c.a. 1816. Here, he met and married the daughter of another Co. Wexford native, Margaret Lacey. From this point, he follows the family, complete with historical background, reminiscences, anecdotes, and family stories forward through time. It is more than just a genealogy of the Doyle family, it is a history of Mermaid, and presents to us a large amount of material of interest to all researching families in Mermaid and surrounding areas. "A Faith Walk" is a history of the Roman Catholic Diocese of Charlottetown, and of its parishes. A beautiful coffee table format book, its pages detail the history of the Roman Catholic Church on Prince Edward Island. Its author, the Rev. Art O'Shea, is the historian for the diocese. Introduced by the Most Reverend Vernon Fougere, D. D., the book comes out in time for the 150th Anniversary of the Diocese in 2004. Its pages detail the beginnings and the history of Catholic Settlement on the Island and the lives of those early settlers who worshipped God, the Island's Catholic Educational Institutions, Health Care Institutions, Religious Orders, Bishops of the Church, with a detailed history of each, illustrated with beautiful photographs. The second portion of the book gives the histories of the Parishes of the Diocese, with photographs and history of each Roman Catholic Church on the Island. This is a book you will treasure, and one you will find yourself looking at time and time again. The history is detailed, and the photography excellent, and with its high quality printing and binding it is a bargain for $20.00. "Bidding farewell to his native village of Tydavnet, County Monaghan, Ireland, circa 1839, Samuel McKenna's son Patrick, like so many of his compatriots seized the opportunity to begin a new live in Canada. Accompanied by his bride Margaret McCarville, two sisters, a cousin "Long Patt" McKenna, and Patrick and James Greenan, he crossed th Atlantic and eventually settled in Lot 26, Newton, Prince Edward Island. The "Monaghan settlers" were among the first pre-famine Irish emigrants to make the townships of Middleton and Kinkora in Prince County their new home.... It was there that Patrick, his relatives and friends settled and where many of their descendants remain to this day. " This is a 145 page book, soft cover, 8 1/2 by 11. It contains approximately 850 names in the in the Index of Names, prominent among them Creamer, Campbell, Duffy, Greenan, Hughes, Kilbride, Mulligan, Murphy and Trainor. There are 180 pictures as well. The book is $25 and is available in Halifax or by mail from Sr. Olga at omckenna@schalifax.ca , phone (902) 457-3500, or on PEI from Bernadette Mulligan at bernadettekinkora@yahoo.ca , phone (902) 887 - 2328. Price: $ 24.95 Cdn plus postage. Just a note to let you know that Georges Arsenault new bilingual book "La Roche and Grand Ruisseau: An Illustrated History of Egmont Bay and Mont-Carmel" is now available. The 173-page book is published by La Grande Marée and translated by Sally Ross. It is divided into 10 chapters and covers topics such as pioneer families, economic life, Catholic Church, education, daily and community life, built heritage, etc. With maps and over one hundred photographs borrowed from innumerable family albums, this book is a wonderful visual testimony to the rich Acadian heritage of Prince Edward Island. In New Brunswick, it is available at French bookstores across the province. Available From: Author, address below! Price: $24.95 Cdn. plus $5. shipping/handling. Samuel, a Jesuit priest, sailed from Glasgow, Scotland in 1790 and on the voyage he met Elizabeth Wilder, who was coming to P.E.I. to work as a governess at the home of Gov. Walter Patterson. Samuel gave up the priesthood and in 1792 he married Elizabeth at St. Paul's Anglican Church in Charlottetown, P.E.I. They worked at Warren Farm in Warren Grove, P.E.I. before moving to Morell where Samuel was employed on a farm. He was attacked by a bear while cutting lumber in the woods and died from his injuries. Elizabeth took their five children back to England. William and Robert returned to P.E.I. in later years and the history documents their families. Robert became the first Mayor of Charlottetown, and William settled in Lot 16, P.E.I. The history includes such families as: Adams, Diamond/Dyment, Hutchinson, Millar, MacLean, Ramsay and Woolner to name a few. It also contains many valuable pictures, letters and documents. Saint Joseph's Parish has just published "A History of Kelly's Cross Parish". This book, originally printed in the early 60's, has been updated, adding 40 more pages of information and corrections. It includes the complete families for all the names as shown on Lake Map of 1863. This section of the book will be of particular interest to persons with ancestors from the parish and (Lots 29 & 30). The names will be the closest thing to a ship passenger list for those immigrants from Errigal Traugh, Donagh, Tyholland, Tedavnet and Roslea in North Monaghan that is available for this area. Price: $15.00, or $25.00 including shipping. "A History 0f New London and Springfield is by far the most impressive parish history I have had the privilege of reading; it is a model of its kind. Its impressiveness lies in its remarkable comprehensiveness, its high standard of historical and photographic research which is fully referenced, and its appealing presentation of textual and visual material. In 1995 the parishes of New London and Springfield, with their four churches - St. Thomas', St. Elizabeth's, St. Stephen's and St. Mark's - all located in the central part of Prince Edward Island on the Gulf of St. Lawrence side, came together to form a pastoral unit." "Two years later the parish councils approved the updating of the parish histories in preparation of the approaching millennium. They formed a Church History Committee to oversee the research, publication, fundraising and prepare a Church History web site. Although most parish histories incorporate some information on early settlement, researchers for this book completed a surname survey of present parishioners. They used this information to provide a statistical analysis of national origins and religious denominations; thus giving a most informative overview of the religious heritage of early settlers. They selected, as representative, seven family histories to portray their ancestral religious heritage from the time of their emigration until the present. In 1959, Canon Thomas Millman, the noted Anglican historian and native of Burlington, published his history of The Parish of New London: A History. His work is reprinted in the Pastoral Unit history along with Ruth Paynter's interesting sketch of Millman and his contributions to the Canadian church's history. The Pastoral Unit authors carry the parish's story forward to 2000, incorporating clergy biographies, histories and activities of lay readers, servers, altar guilds and choirs and organists, Anglican Church Women, Sunday schools and similar church organizations. The same format is used for Springfield Parish. These are followed by property histories of St. Thomas's, St. Mark's, St. Stephen's, and St. Elizabeth's, their associated cemeteries and church halls. Canon Robert Tuck, author of Gothic Dreams, a biography of William Critchlow Harris, provides a detailed architectural assessment of each church, one of which, St. Mark's, is a Harris church and another, St. Elizabeth, remodeled by Harris. Equally innovative for a parish history is the section on liturgical practices of the churches. I for one was com-pletely unaware that, since 1971 on the last Sunday in April, St. Thomas's has been decorated with fishing gear for the Fishermen's Service and Symbolic Blessing of the Fleet. Other sections include Remembrance of War Veterans with parish lists of those who served; Consecrations and Anniversaries; and as an important record for posterity, listings of Memorials, Gifts and Endowments made over time to each of the four churches. Parishes seeking to create a parish history, or to up date those already in print, will find in A History of Pastoral Unit of New London and Springfield a model for research and writing that sets a high standard indeed." A history of the community of Southport, and its peoples. Chapters on The rising of the Village, Then and Now, Early History, Businesses, Institutions, Transportation and Communications, People, Places and Events, Historical Homes and their owners, and much more! Book: A Jolly Wake and Other Stories. Growing up on Prince Edward Island in the Late 1800s. The unpublished manuscript for this book was originally written over fifty years ago by the late Rev. Dr. John Thomas Ingram Bryan (1868-1953), under the title A Boy of Isle St. Jean - A Story of Canada. The manuscript was discovered by the editor almost thirty years ago while doing research on his award-winning second book - Along the North Shore: A Social History of Township 11, P.E.I., 1765-1982. Consisting of twenty-four episodes or "stories," the manuscript was actually Mr. Bryan's memoir about his life as a boy growing up in the small rural community of Foxley River, Lot 11, in west Prince County during the 1870s and 1880s. His parents had emigrated from Ireland to New York state about 1867 and by 1869 had settled at Foxley River to be near an uncle who had settled there during the 1850s. Only two copies of Mr. Bryan's manuscript have been located by Mr. Morrison to date - both on P.E.I. ; the original copy has not been found. It appears Mr. Bryan wrote down his memories about his early boyhood on P.E.I. and distributed them to a small group of relatives upon completion. After months of searching, Mr. Morrison finally located two granddaughters in England, and a great grandson in Ontario, all of whom had never heard of this particular manuscript. Mr. Bryan had a distinguished career as an Anglican priest, university professor, author, poet, and literary scholar in Canada, United States, Japan, and finally in England where he died. He began his career as a teacher in the small, one-room schools at Freeland and South Kildare, P.E.I. after graduating with a teacher's license from Prince of Wales College in 1887. He left the Island to pursue his education two years later, and would eventually graduate from King's College, Windsor, N.S., Wycliffe College, Toronto, the University of California, and the University of Pennsylvania. He became the first settled priest in the present St. Paul's Anglican Church, Charlottetown, where he ministered from 1896-1899 when he left the Island again, this time to take up mission work abroad. He never returned to Prince Edward Island again to live. In addition to retitling the memoir, the editor, Mr. Morrison, has done extensive research into the author's background and career and has provided an introduction, nearly forty illustrations, extensive notes and annotations, and included an index to the book. Mr Bryan's memoir provides an invaluable first-hand account of social life on Prince Edward Island during the late Victorian period. A plethora of proverbs, expressions, words, and terminology no longer in use today has been preserved for posterity. The sheer scope of his topics is exceptional and include such topics as: customs, wakes and funerals, lumbering and rafting logs, shipbuilding, Native People, fishing and lobster factories, hunting, transportation, flora and fauna, tea parties, and education. Furthermore, the detail of his recollections provides a wonderful in-depth look at many pioneer skills such as hewing logs, felling trees, fishing eels, catching trout, and shooting lynx. His striking descriptions allow the reader to clearly visualize and mentally understand what he writes about. His powers of observation and minute attention to detail also provide wonderful descriptions of individuals - descriptions that focus not only on how individuals looked physically, but also on the nature of their personalities. Tuberculosis, or "consumption", was a dreaded disease in the nineteenth and twentieth century, especially so because it was so easily spread. The community of Emyvale, Prince Edward Island was the site of the first tuberculosis hospital on the Island. A Magnificent Gift Declined: The Dalton Sanatorium of Prince Edward Island 1913 - 1923 documents political and social issues surrounding the rise and demise of this hospital in the midst of a severe tuberculosis epidemic. "This well researched and well documented monograph on the Emyvale hospital is an exhaustive and thoroughly comprehensive story of the history of Prince Edward Island's first sanatorium. The crucial role played by Charles Dalton, who financed the building of the Sanatorium and donated it to the Provincial government, and the treacherous part employed for some four years by Premier John Bell enlivens this complex story. A wonderful read." "Leonard Cusack has done good service for Prince Edward Island political and social history. His clear-sighted examination of the political maneuvering and posturing of those days reveals clearly what the sad effects of poverty and political partisanship, mixed with a dose of hypocrisy, can do to a worthy cause." Dedicated to a great person and a dear friend Clara McDonald (1941 - 1995), A Magnificent Gift Declined: The Dalton Sanatorium of Prince Edward Island 1913 - 1923 is a book of approximately 150 pages - a fascinating, well illustrated and well documented account of the time period in question, written by a retired high-school teacher and public servant of the P.E.I. Provincial Government. Leonard Cusack, who lives in Emyvale with his wife Catherine, teaches history at the University of Prince Edward Island and has an avid interest in Canadian social and political history of the 20th century. The book is interesting and fast-paced. A list of photographs and illustrations, forward, preface, followed by eleven chapters, a bibliography, index, and a write-up about the author sums up in a nutshell the contents. This book is entitled "A PEI Mother's Legacy of Love - The Life and Recipes of Margaret-McAvoy-Griffin-Mullen", is about the mother of author, Dolores. It tells her story from being born in Halifax at the time of the Halifax Explosion, the death of her mother, going to the Halifax orphanage with 2 siblings, coming to PEI as a foster child, and raising 10 children. It also includes some history on the Explosion and the community of Emyvale, PEI where she lived. All proceeds go to a scholarship at the UPEI Shool of Nursing in her name. Soft Cover, 256 Pages, 370 photos. Price: $29.95 + $7 s/h Canada, $17 s/h, Overseas, $25 U.S. Shipping included. The initial printing of 2000 copies of the book sold in 2 months, and a second printing of an additional 1000 took place early in January. 3070 have sold to date, and a third printing available in December, 2001. This printing is almost sold out, and fourth printing in the works. I told you the book was good - it has shattered records for sales of Historical books! The Prince Edward Island Railway, which operated from 1875 until abandonment in 1989, is the subject of this exciting new book by Allan Graham of Alberton, PEI. The book follows the railway from its construction as a 42" narrow gauge road, through PEI's confederation with Canada in 1873, whereupon the federal government assumed responsibility to complete the road, pay the railway debt, and provide rail service and continuous steam navigation with the mainland. It covers Canadian National's ambitious standard gauging project of the 1920's, dieselization in 1950, and eventual abandonment in 1989. This book is of outstanding quality - The first thing that surprised me was its weight and the quality of the photographs - heavier than comparable books, due to the laminated pages. It is not only a wonderful resource, but a keepsake of our rails that were. This is one of those books that I cannot recommend highly enough. Available At: Amazon, also from publisher in electronic and print format. Price: See Publisher or Amazon. Hamill combines what he learned of his ancestors with "pure Irish imagination" to create a beautifully written novel about an Irish family, the Hamill's, living in County Antrim during the second half of the 18th century. Brothers Andrew and Anthony Hamill buck tradition by leaving the family farm for two very different carreer paths. Andrew goes to Belfast to learn the "white trade," while Anthony enters a Catholic seminary in France. When Anthony abandons his calling and joins his brother in Belfast, the wto work together at a linen mill - until a fatal trajedy at the mill sends Anthony back to his farm roots. He marries Margaret Houde, and the two move to Ballyclare, where they run a farm they call Tranquility. There, they raise their family, create lasting relationships and strive to deal with the bloody conflicts in Ireland during the last decade of the 18th century. Hamill is an Irish-American. His paternal ancestors were Ulster Presbyterians who immigrated to Prince Edward Island, Canada in 1854 and then to America. Watch for the sequels, the first set in Belfast from 1789 to 1854, when James Hamill and his three sons leave Ireland for PEI. Its tentative title is "The Man From Sandy Row". The next will be set in PEI from 1854, as the Hamills set out for PEI to 1910, when Art's Grandfather leaves for America. It will likely carry the title "A Place Called Greenmount." This is the story of Thomas Hooper who was forced to flee to Bedeque, P.E.I. in 1784 after the American Revolution ended the previous year. His wife had died in New Jersey shortly after the birth of their child, while her husband,Thomas, was looking for a suitable home on P.E.I. to bring her and their large family to safety. Her death was occasioned by her frail condition after childbirth, in addition to physical and sexual abuse suffered at the hands of the rebels searching for her loyalist husband. The book traces Thomas Hooper's tragic life and the times in which he lived. It also chronicles the story of their descendants. Nancy E. Neal also writes about the wonderful history of the Bedeque area, with some wider reference to the Island, itself, during the late 1700s and 1800s. This book is a wonderful reference for Hooper descendants and genealogists everywhere, and could be the center piece of any personal library on Prince Edward Island history or genealogy. It is a must for Island genealogists and those collecting P.E.I. books. For individuals wishing to trace family links or deepen their understanding of how and why Prince Edward Island came to acquire its distinctive Scottish communities, Lucille H. Campey, a Canadian who now lives in Britain and who has over thirty years experience as a researcher and author, has published an interesting little book of 182 pages entitled A Very Fine Class of Immigrants - Prince Edward Island's Scottish Pioneers 1770-1850. 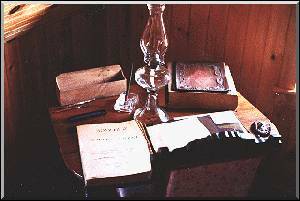 There have been a number of books written on the Scottish people who came to Prince Edward Island during the period between 1770 and 1850. This latest work, because of inclusion of previously unreported ships crossings, shipping sources like "Lloyd's List" and the Lloyd's Shipping Register, and underused sources such as customs records and newspaper shipping reports, provides the most comprehensive account to date of the influx of Scots to the Island. Copyright 2001 by Lucille H. Campey, A Very Fine Class of Immigrants - Prince Edward Island's Scottish Pioneers 1770-1850 is published by Natural Heritage/Natural History Inc., P.O. Box 95, Station O, Toronto, Ontario, M4A 2M8. It is edited by Jane Gibson, printed and bound in Canada by Hignell Printing Limited, and is available for $23.95 at Island bookstores. Available At: Original printing gone, but reprint now available! The Garden of the Gulf Museum has reprinted the very popular community history, "A View from the Bridge". First published in 1984, it tells of the town's development through the early days until the 1930's. The excellent research done in the early 1980's by: E. Mary Stuart; Gordon Jackson; Karen Garrett; Karen Murphy and Finley Martin, is the backbone of this book. The information acquired was then thoughtfully compiled by Finley Martin, 1983 Project Manager, of Beach Point. Full of stories of people and places, the book is comprehensive, informative and thoroughly entertaining. Over the years "A View from the Bridge" has become increasingly difficult to acquire and the Museum has had many requests. In the fall of 2004, the Board took on the happy task of having the book re-published. It is now our pleasure to announce that "A View from the Bridge" is available for sale at both the Museum and Town Hall at a cost of $19.95. To reserve your copy, please call the Museum at 838-2467, or write the Garden of the Gulf Museum, P.O. Box 1237, Montague, PEI, C0A 1R0 today! Alberton and Area - A Pictorial History Through Time, compiled by the Alberton Millennium Committee, edited by Betty M. Jeffery, Allan J. MacRae, and Lorraine Warren, is a 153-page book comprising a magnificent collection of 300 photographs and documents, many never before published, together with captions and pertinent historical comments about the town of Alberton, P.E.I. and adjacent communities. Where most books on heritage tend to concentrate on the politics of history and why things happen, Alberton and Area - A Pictorial Experience Through Time concentrates on the human side of the story. This book was produced as a Millennium project and as an answer to the question of several community-minded people of the area "How do we commemmorate the year 2000, raise funds for the Alberton Museum, and at the same time recognize the legacy of those who came before us?" As a result, the Alberton Millennium Committee was created with the mandate to collect, organize, and publish photographs and documents which illustrate the area's past prior to the year 1960. The final result is Alberton and Area - A Pictorial Experience Through Time. This book is dedicated to four people who have contributed a great deal to heritage in the area. They are Alice Green, the author of the book "Footprints on the Sands of Time"; Eileen Oulton, founder of Alberton Museum; Blanche Phillips, Alberton Museum volunteer and supporter; and Frank T. Pridham, photographer and creator of Alberton Museum Photo Collection. Alberton and Area - A Pictorial Experience Through Time is organized into nine chapters. They are as follows: Main Street; Churches; Schools; Houses; People; Industry; Sports & Recreation; Scenery; and Miscellaneous. By endeavouring to illustrate as many events and daily activities as possible, the creators of this book hope that the life and spirit of this area before 1960 can be reclaimed and preserved for future generations. Alberton and Area - A Pictorial Experience Through Time is published by the Alberton Historical Preservation Foundation Inc., copyright 2000, ISBN 0-9687757-0-5. Cover design for the book is by Kelly Chabassol, Jackie Ellsworth, Michael Lynch and Courtney Matthews, and it was printed and bound by Williams & Crue (1982), Summerside, P.E.I. Hardcover copies of the book sell for $40.00; softcover for $25.00 each. For mailouts, add $7.00 per book for postage and handling costs. This fine volume may be obtained from the Alberton Historical Preservation Foundation Inc., P.O. Box 515, Alberton, P.E.I., C0B 1B0 or from many local bookstores. During the last weekend in July 2000, at the annual Larry Gorman Folk Festival at Tyne Valley, P.E.I. a new book by a writer of West Prince area was launched. This book, entitled ALONG LOT SEVEN SHORE, written by Donnie Doyle of Campbellton, P.E.I., is a collection of folksongs and other writings by Harold, Steve and Donnie Doyle - Harold being Donnie's father, and Steve being Harold's first cousin. These folksongs and writings are mainly about people and events "along Lot 7 shore" during the twentieth century and is dedicated by Donnie "first and foremost to my father, whose example inspired me to become a writer of songs; second, to my mother, who unconditionally loved us, her children, and who sought to instill in us a knowledge and love of God; and finally, to my Irish ancestors who left Erin's shore with very little in worldly possessions, but who carried with them a strong Christian faith and a sincere love for truth." I particularly enjoy this book because, like Donnie Doyle, my own ancestors, the Griffins, also came from Erin to Lot Seven in the early 1800's. ALONG LOT SEVEN SHORE shares with us songs about home and exile, songs about tragedies and people and memorable events - songs that define a community. Along with the lyrics and musical notation for twenty-one of his and his family's folksongs, Donnie tells us the stories behind the songs, revealing the "folk" in folksong. As John Cousins, another folklorist of the Lot 7 area, states on the back cover of Donnie's book: "Donnie Doyle is part of a long line of traditional poets in Lot Seven. He is very aware of his responsibilities to the people and things he writes about. Like the springs that feed the brooks, this place and its people gave him his songs and his poetry. Now, in the ancient tradition of the songmaker, he is giving them back." Book may also be ordered from: Donnie Doyle, Bloomfield, R.R.#1, P.E.I. C0B 1E0. Price: $44.95 CDN + S/h $6.95 on Island/$8.95 off Island. ALONG THE NORTH SHORE - A SOCIAL HISTORY OF TOWNSHIP ELEVEN, P.E.I., 1765 - 1982, was written by J. Clinton Morrison, Jr. and first published by the author in 1984. The third printing is published by CRESCENT ISLE PUBLISHERS, Summerside, P.E.I., c/o J. Clinton Morrison, publisher/writer. The book portrays the life and times of the people of Township 11 (Lot 11 as it is more familiarly known), P.E.I. since its survey in 1765. Although it deals specifically with the communities of Conway, Freeland, Inverness, Foxley River, Woodbrook, and Murray Road, the book is of particular interest to numerous Prince Edward Island families as there are many connections between Lot 11 and the rest of the Island, especially Prince County. In addition, several Lot 11 families originated in Nova Scotia and New Brunswick and others have intermarried with residents of these Maritime provinces. It also describes community life in general on Prince Edward Island throughout the nineteenth century and is the only township history to be written on Prince Edward Island to date. ALONG THE NORTH SHORE is organized into five parts, each dealing with a dominant theme relative to the growth and development of the township: Part One - Struggle and Growth, depicts the early historical founding of Lot 11 and the six communities that developed within its boundaries during the nineteenth century; Part Two - The Legacy of the Sea, documents the story of the Sandhills lobster factory era, the fishery, shipbuilding, and the rum-running days during Prohibition; Part Three - The Land and its Resources, outlines in detail the growth of agriculture, fox ranching, and numerous other smaller industries that thrived within the township over the years; Part Four - Social Life, examines the religious life, educational development, entertainment, folklore, and literary contributions from the area; Part Five - Record of a People, traces the history and genealogies of approximately 200 different family surnames found within the township over two centuries of settlement; in addition, Part Five also contains a military biography of over 150 veterans of both world wars who lived in the township. This book has not only been popular on "the Island" but also has a strong readership off the Island, more recently in the New England area, where literally thousands of people with "Lot 11 roots" reside. There is scarcely a family within the township that does not have "American cousins" whose ancestors left Lot 11 during the period of great emigration to the "Boston States" between 1860 and 1930 in search of employment. For historians and researchers ALONG THE NORTH SHORE is a valuable reference tool as it is meticulously footnoted and indexed. There are more than 1000 different surnames in the index, comprising about 14 000 personal names. Book: "An Index to the Community Histories of Baltic, Clinton, Darnley, French River/Park Corner, Hamilton, Irishtown/Burlington, Indian River, Long River, Malpeque, Margate, Spring Valley, and Sea View"
This book is a cross-referenced nominal index of twelve Prince Edward Island community histories: History of Baltic Lot 18, The History of Clinton, The History of Darnley, History of French River/Park Corner, Pathways to the Present (Hamilton), From the Top of the Hill (Irishtown/Burlington), History of Indian River, History of Long River, Malpeque and Its People, History of Margate, History of Spring Valley, and From the Ponds to Sea View. It contains about 40,000 individual references compiled into listings for over 24,000 persons. All parts of each book were indexed, including the genealogical and historical sections. It also has an introductory section with instructions how to interpret the index and obtain the books or photocopies from the books. Top twenty names: Ramsay/Ramsey, Campbell, MacKay, Adams, Stewart, MacLeod, Champion, Woodside, Beairsto, Clark, Bryanton,MacLellan, Bernard, MacDonald, Murphy, Thompson/Thomson, Paynter, Crozier, MacGougan, Cousins. See also Dave's "Prince Edward Island Strays in the 1871 New Brunswick Census"
... and A Cast of Thousands is a genealogy of the descendants of John Lane and Joyce Lester/Lyster of Ireland, later of Mt. Mellick, PEI. The book is 751 + pages (8 x 11 inch), includes substantial genealogical data concerning nearly 4,000 of their descendants, family stories, and more than 100 heirloom photographs. In addition to obtaining source materials as necessary, Mr. Raywalt was in touch with literally hundreds of Lane descendants all across Canada and the United States, and the vast majority provided appropriate family information. A copy of the book may be found at the PEI Heritage Foundation. TO PURCHASE: Higginson Book Company, P. O. Box 778, Salem, Massachusetts 01970, USA. Telephone (508) 745-7170. Fax (508) 745-8025. Available with hard or soft cover. Priced accordingly. The author may be contacted at jraywalt@aol.com, Jim Raywalt, 1716 Bigley Avenue, Charleston, WV 25302-3938, (304) 340-0200. Book: And the River Flows On! Available At: Out of Print - try Used Book Stores! The History of the residents of "Mermaid Farm", and their perception of P.E.I. history surrounding them and guiding their lives. While this book is based upon Mermaid Farm, it is applicable to early settlers everywhere, as they built the continent we know now. Compiled by: Abegweit Branch, UEL Assn. An Island Refuge: A history of the United Empire Loyalist settlement on the Island, their family histories, the regiments, Muster Rolls and Claimants List. An excellent reference for those researching their UEL ancestors, as it includes many Loyalist lineages, claimant's lists, and muster rolls for those Loyalists who settled on St. John's Island (Prince Edward Island). Requests for the book continued coming in. In 1999 it was decided to do another printing of this book. The initial printing of 4000 copies had sold out in the 17 years since it had been printed. The original 1983 printing plates were no longer in existance. In 2000, the Island Register and a number of its users began transcribing the book into computer format for future printings, and to make it easier to make corrections between printings. A number of corrections and updated lineages were included. This was completed in 2003 and passed on to the Abegweit Branch. For a variety of reasons, the reprint didn't happen until this year, and it was worth the wait. July 27th, we finally took delivery of two hundred copies, and more copies can be printed on relatiively short notice, and allowing for corrections between printings. To view a passage from the book, click here! C0A2EO to order by mail. Order "An Island Refuge" Today! Please Allow 6-8 weeks for delivery. ANOTHER CENTURY - ANOTHER ERA: Memories & Recollections of Prince Edward Island and the 20th Century, ISBN 0-9686908-0-7, published in April 2000, is a 148-page anthology of poems, short stories and commentaries written by Island writers, former Islanders, and new Islanders based upon the theme "Prince Edward Island and the 20th Century - a Century of Enormous Change". Published by Creative Communications P.E.I., Richmond, R.R.#1, P.E.I., C0B 1Y0, edited by Dorothy Griffin-Farish, and printed by City Copy Shop, 233 Water Street, Summerside, P.E.I.,C1N 1B4 this anthology is written as a millennium project at the close of one millennium and the beginning of another as a tribute to 20th century life on Prince Edward Island during one hundred years of many and overwhelming changes to this "Cradle of Confederation." "As I Remember Them - The Neighbours of Little Sands", is written by long time resident of Little Sands, Dr. Stewart MacDonald. It is a book of reminiscences about the area, and of its past residents. Covered in the book are: Milburn, Jimmie, and Sam Dixon, Donald MacPherson, John MacDonald, Neil MacDonald, Murdoch and Hughie MacNeil, Alex Blue, George Blue, Malcolm MacNeil and Sibbauld, Willie MacDonald, Duncan (Tailor) MacDonald, Jimmie (Tailor) MacDonald, Dan Nicholson, Dan MacPherson, Dan MacRae and Archie Munn, Johnnie Currie. Also included are Colin Hector MacNeill, Angus Blue, Malcolm Smith, Smith and Ferguson, Lemmie MacLean, Donald MacNeill and Angus MacLean, Joe Sickles and Harold Maclean, Archie MacNeill, Roderick MacKenzie, Lauchie MacLean, Charles MacKenzie and Monty, John Dan MacLean and sons, Danny Blue, John A. Gillis, Smith or MacNeill, Johnnie Blue, Angus Munn, Malcolm MacNeill, Johnnie Torquil MacLeod, John Dan MacLennan, Duncan Blue, Maclean Family, Johnnie Hector MacLean, Peter MacLean, the area's school teachers, transportation, and the effects of WWI and II. Available At: Cooper's Red & White, Eldon, PEI, Island Bookstores. Transcripts of oral histories from elder Belfast residents, a collection of their life stories and history. A very interesting book with Belfast's History though the eyes of those who lived it! Book: Black-Eyed Susan: The Adventures of a Farm-girl. Black-Eyed Susan: The Adventures of a Farm-girl. Author Jeanette Birch has produced another masterpiece. Jeanette, born 1912 in Freeland, P.E.I., is retired after a quarter century as a schoolteacher. She is the author of "Leaves from the Birches of Avoca", and co-author of "Climbing the Hill", the Birch Hill history. "Black-Eyed Susan" is a novel based on the life of a mischevious girl growing up on a P.E.I. farm in the early 1900's Enjoy the hilarious tales of "Blackie's" misadventures on the farm and in, and around, the one room school. Follow "Blackie" from her birth as she matures, till the day she bids her beloved Island farewell, like so many Island girls, and heads for the "Boston States" to become a domestic. This book will be enjoyed by all, and will leave you with an indelible impression of what it was like to grow up on a family farm in P.E.I. the Tyne Valley Drug Mart, O'Leary Guardian Pharmacy, Consolidated Credit Union, Summerside, and from her two daughters: Bev. Millar, Linkletter, PE (1-902-436-2910) or Marnie Noye, Summerside, PE (1-902-436-5553). Available At: Bookmark, Charlottetown and other Island Bookstores. A history of slavery on Prince Edward Island, and our Black Islanders like Dembo (Dimbo) Suckles, Life under Slavery, The "Bog", Racism in popular Culture, and more! Price: $24.95 CDN + S/h $12.95 to Canada _Inquire as to US rates. BOOZE: A Social Account of Prohibition on Prince Edward Island, 1878-1948, 17As author or general editor, this is Mr. Morrison's ninth book on Island history. Initially begun in 2006, BOOZE: A Social Account of Prohibition on Prince Edward Island, 1878-1948 has been seven years in the making. Price: $24.95. Softcover, 6 in. x 9 in., 440 pages, perfect bound, includes a foreword, 3 maps, 53 illustrations, 36 sidebars, appendix, footnotes, bibliography, index, and a full color glossy cover. .
Book 5: The Liquor Trade - provides a detailed look at the Prohibition era on PEI and chronicles the rise of the major problems of bootlegging and rumrunning in Island society resulting from the outlawing of the beverage use of alcohol. Book: Bonshaw - A Stroll Through its Past! A history of the community of Bonshaw, well documented and concise. Chapters cover the beginnings of the community, public buildings, businesses, industries, transportation, houses, and much more! BURNTISLAND TO BIDEFORD a 320 page History and Genealogy of Alexander and Janet (Crombie) Millar, published by Bev and Wyman Millar in association with Crescent Isle Publishers, covers a period of 154 years - from 1850 to December 31, 2003. Alexander Millar. who lived in Burntisland, Scotland, sailed from Liverpool on June 26, 1850. He was 47 years of age with a large family and grandchildren. His wife and a number of his family members followed one year later. They resided in Charlottetown and Bedeque before settling in Bideford, P.E.I. The fully indexed Genealogy contains not only the log kept by Alexander on his voyage, but many valuable pictures and documents. It also covers more than nine generations of the Millar/Miller families. The book will be available from the authors after June 26, 2004. BY THE OLD MILL STREAM - HISTORY OF WELLINGTON 1833 - 1983 is a 576-page book first published in 1983 by the Wellington Senior Citizens History Committee in association with the New Horizons Program of the Department of Health and Welfare Canada. This book was printed by Williams and Crue (1982) Ltd, Summerside, P.E.I. A second edition is just off the press - printed in 1997 by public demand. This is a very comprehensive and well-illustrated history of Wellington up to 1983, including family histories, background of the area, manufacturing, recreation and sports, organizations, various churches and other buildings, and names of those serving during the Wars. Cost of this history is $30.00 plus mailing and insurance. Contact Carol Gallant (902) 854-2660, or May Arsenault (902) 854-2736, for further information. Two volumes, softcover, 6 in. x 9 in., 512 pages in total, with an introduction, maps, illustrations, and a full color cover. Publisher: Crescent Isle Publishers, Summerside, P.E.I. Available from: Indigo, Chapters, Coles, the Bookmark, Avonlea BookStore, several Murphy’s Pharmacies, and a variety of other outlets which sell Island books, PLUS direct from the author, J. Clinton Morrison, 157 Victoria Road, Summerside, PE Canada C1N 2G6; e-mail: crescentisle@eastlink.ca; telephone (Home) 902-436-8518 (Cell) 902-439-2007 (Fax) 902-436-7717. During the nineteenth century in Britain a multitude of great events and influences changed the lives of its people forever, most notably the Industrial Revolution, the Napoleonic Wars, the devastating “Great Famine” in Ireland, and the tragic Scottish “clearances.” The social and economic upheavals that resulted from these occurrences made it necessary for thousands of people to choose to abandon their native land for the overseas colonies. “Century of Farewells: A Biographical Dictionary of Prince Edward Island Immigrants, 1800-1900” documents the arrival of thousands of these immigrants to Prince Edward Island. Most of these 19th century arrivals came from the British Isles and left their homeland for a variety of reasons, but a common thread bound them all together - the desire to have a better life in the New World. Many left their homes by their own choice, and with the financial means to begin a new life abroad, but the vast majority abandoned their native homeland out of sheer necessity. Some emigrants were encouraged and supported by paternalistic landlords, such as Lord Selkirk, but most left their native lands with meagre support and guidance from any leader, relying upon hope and good fortune to see them through. The vessels that emigrants took in their Atlantic passage westward to Prince Edward Island were seldom comfortable. Overcrowding, putrid food, stale water, disease, and storms at sea characterized many of the emigrant voyages which usually lasted from four to six weeks. More than seven thousand cross-referenced entries in this two-volume dictionary document the lives of perhaps one-quarter of all the immigrants who arrived on Prince Edward Island during the nineteenth century. The documentation of immigrant arrivals by Mr. Morrison is an on-going project and he has already commenced a second edition which will expand and update this first edition. He estimates that its completion in a few years time should contain at least three thousand new entries, in addition to expanded information on those in this first edition. Statistics are unavailable as to how many people actually settled on P.E.I. during the 1800s, but Mr. Morrison estimates that from twenty to thirty thousand people arrived during the century. His research is based upon published histories, newspaper notices of death and obituaries, cemetery inscriptions, and a variety of other sources. It is hoped that this work will help foster a greater interest among Islanders and others in documenting their family histories, and assist them in their search for their “roots” in the country of origin of their immigrant ancestors. Mr. Morrison is a retired teacher, having taught in Prince Edward Island schools from 1968-2003. In addition to being engaged in research and writing for over thirty years, he is also founder and owner of Crescent Isle Publishers. He and his wife, Elizabeth, and their children, Sarah Anne and Andrew, reside in Summerside. This is his eighth book, all pertaining to some aspect of Prince Edward Island’s history. 2011 is a special year for Summerside's Military History and those who served and trained here at some point during the past 70 years. The first recruits of the British Commonwealth Air Training Plan (BCATP) commenced training at RCAF Station Summerside 70 years ago in 1941. By the end of World War II over twelve thousand air personnel trained on P.E.I. bases, slightly over half at R.C.A.F. Station Summerside. To celebrate this anniversary a huge celebration is being held from August 25 to August 28, 2011, featuring the first Air Show since the early 1990's and the grand opening of Air Force Heritage Park PEI. CFB Summerside: Our Base - Our History (1940 - 2010), Souvenir Booklet, City of Summerside and the Summerside Area Historical Society, will be available at this celebration, as well as at the MacNaught History Centre and Archives, 75 Spring Street, Summerside, and at the Eptek Centre in Summerside. Although less than 60 pages in size, this attractive, well- illustrated booklet, dedicated to all the air personnel ever associated with RCAF Station/CFB Summerside and especially to its flight instructors and ground crews, is jam-packed with information on CFB Summerside. Two names, those of William Higgins of Kensington, P.E.I., who received the Air Force Cross for his efforts, and John "Scotty" Campbell of Summerside, a recipient of the Distinguished Flying Cross, are mentioned in the dedication. The Table of Contents of the booklets contains more than twenty-five entries. Just some of these include: "No. 9 Service Flying Training School," "No. 1 General Reconnaissance School," "TheWellington - Mount Pleasant Connection," "Milestones of the Base at a Glance," and "Dark Days for the Town of Summerside." Near the end of the booklet is a list of casualties, followed by a page of acknowledgments to all who helped make this booklet possible. The front cover features a picture of the location of CFB Summerside. The back cover features the RCAF Logo on the RCAF Tartan. The booklet incorporates information from previous Summerside air force base anniversaries (the 40th in 1980 and 50th in 1990) and provides additional information, such as on the #200 Wing of the Air Force Association of Canada and #53 Air Cadet Squadron - to name a few. The booklet includes a survey to test the market for a full-length book on the theme of Summerside and its Air Base from 1940 onward. The booklet is supported by the City of Summerside and was put together by a volunteer committee of the Summerside & Area Historical Society. Island born history teacher and AFAC 200 Wing member David Higgins from his home in Summerside compiled the information for the booklet to honor the veterans. If you are looking for a concise, easy-to-read, illustrated booklet concerning the history of CFB Summerside look no further than CFB Summerside: Our Base - Our History (1940 - 2010), Souvenir Booklet, City of Summerside and the Summerside Area Historical Society. A history of the United Church of Prince Edward Island, and of the churches which united to form the United Church: Methodist, Congressional Union, General Council of Local Union Churches, and about 70 % of the Methodist Churches (with the exception of the Free Church of Scotland), and finally, the Evangelical United Bretheren Church. The much acclaimed book, "Charlottetown - A History" by Peter E. Rider is finally out! Peter, an Atlantic Canada historian and curator at the Canadian Museum of Civilization for over 30 years has authored numerous articles and Chapters of books in the fields of urban, material, public and social history with an emphasis on the Atlantic Provinces, and in particular, Charlottetown. For more than a century, Charlottetown was the only city on a predominantly rural Prince Edward Island. This gave it advantages no other city in North America enjoyed. It also generated problems no other city had to deal with. How Charottetown played the advantages - and coped with other problems - makes for fascinating history. Architectural, busines, social, and Political history. This book explores it all. Charlottetown - A History gathers all these threads and weaves them into a single authorative, but well-written tale. All this in a quality book. Dozens of black and white and colour historical photographs of PEI's historic city. Barnabas Trowsdale, the paternal great grandfather of J. Clinton Morrison, and his trek to the Yukon in search of gold on the "Trail of 98", and the stories told about this adventurer that were passed down orally from generation to generation were the origin of the idea for a book about Prince Edward Islanders in the Klondike. Chasing a Dream: Prince Edward Islanders in the Klondike is an attractive 256-page book printed on glossy paper , jam packed with information, a 7-page forward, information about the author, over 100 maps, photos and drawings. It has extensive footnotes, a bibliography, an appendix, and is fully indexed. This 6 x 9 inch book has a two-color cover and has stitch binding. The illustrations on the cover, chapter headings, section dividers and chapter tail pieces were done by Island artist P. John Burden. The book has thirteen chapters, divided into four sections: the first being "The Dream Begins"; the second "The Call of the North"; the third "A Bittersweet Country"; and the fourth "The End of the Dream". J. Clinton Morrison ("Clint") was born in 1948 in the small rural community of Conway, Prince Edward Island and was educated in the local one-room school house before attending O'Leary Regional High School in 1962. After secondary school he graduated in 1968 from Prince of Wales College and in 1975 from the University of P.E.I. He is a retired educator, having taught in Island schools from 1968 to 2003. He is also a Certified Genealogist in Canada. In 1997 he established Crescent Isle Publishers in Summerside, P.E.I. Clint has been researching, writing, and publishing Island history and genealogy since 1975 and has received numerous awards. In 1978 he published Robert W. Morrison, Sr., Emigrant From the Highlands, and His Descendants, 1831-1978. The Genealogy of a P.E.I. Family. In 1984 he published Along the North Shore: A Social History of Township 11, P.E.I., 1765-1982, which was reprinted in 1987 and in 1999. In 1995 he published Hell Upon Earth: A Personal Account of Prince Edward Island Soldiers in the Great War, 1914-1918. In 2003 he was the general editor of To God Be The Glory: Presbyterianism in Summerside, 1853-2003. Chasing A Dream: Prince Edward Islanders in the Klondike is his most recent work. He has contributed to the West Prince Arts Council's publications of short stories and poetry on numerous occasions and has written several articles for the semi-annual publication, The Island Magazine, published by the Prince Edward Island Museum and Heritage Foundation. He currently has two genealogical manuscripts in progress - Exiles of Erin: The Boyle Family of Old Halifax Parish, Prince County, Prince Edward Island; and Westcountry Emigrant: The Genealogy of Joseph Pow, of Devonshire, England. Clint is also compiling research material on the McNeill and Trowsdale families, in addition to arranging a volume of his poetry for future publication. As well, he is preparing the first edition of Century of Farewells: A Biographical Dictionary of Prince Edward Island Immigrants in the Nineteenth Century. Also, on "the back burner" is a historical novel, Beyond the Sunset, which pays homage to his Scottish heritage. Chasing A Dream: Prince Edward Islanders in the Klondike, ISBN 0-9691824-7-3, copyright J. Clinton Morrison 2004, printed and bound in Canada by Transcontinental Prince Edward Island Limited, 169 Industrial Drive, Borden-Carleton, P.E.I., C0B 1X0 and published by Crescent Isle Publishers, 157 Victoria Road, Summerside, P.E.I., C1N 2G6, is available directly from the author/publisher at the Crescent Isle Publishers address. The price is $19.95 (Canadian funds, from author/publisher, plus $3.50 shipping and handling charges per book - cheaper if more than one book ordered) Morrison may be contacted by telephone at 902-436-8518; by fax at 902-436-7717, and by e-mail at crescentisle@eastlink.ca The book is also available in Island bookstores for $19.95 plus GST. Price: $ 24.95 Cdn - to be published July, 2006! To be published in July, 2006, "Chinese Islanders", by Hung-Min Chang is a history of the early the Chinese settlers on Prince Edward Island. This, one of the Island's smallest immigrant communities, began appearing on the Island as early as 1850, and until now, never documented. From the 1850's to the 21st Century, this book follows the lives and history of this largely undocumented group. As with all of the Island Studies Press books, this is another in an excellent series of studies on Island topics. Book: Contes, légendes et chansons de l'Île-du-Prince-Édouard. This book serves as an introduction to the rich Acadian oral traditions of Prince Edward Island. It features some twenty story-tellers, folksingers and songmakers recorded in the 1970s and 1980s. Much attention is given to the men and women who kept those traditions alive and to the role that they played in the life of their family and of their community. It is also a study on the sources of these traditions and on the dynamics of their transmission from one generation to another. I have just completed our family history which I guess had it's roots at the organizational meeting of the P.E.I.Genealogical Association meeting back in the 70s. Since that time I have been collecting information and have made two trips to the west coast of the U.S. and Canada searching out information.The title is "CROKEN CONNECTIONS - THE RECORD OF IRISH IMMIGRANT JOHN CROKEN AND HIS FAMILY". It is the story of John Croken who immigrated to Summerfield, P.E.I. in 1843 and includes a record of him and his descendants. This 206-page book contains a brief biographical report on each descendant as well as family history and stories passed down in our family as well as some pictures. Each descendant is indexed. It is currently at Williams and Crue being printed and will be available from me by July 3, 1999. The book CROM A BOO FITZGERALD 1858-1993, written by Patrick FitzGerald and published by Williams and Crue Limited, Summerside, P.E.I. in 1993 is a soft-covered 150-page book on the family history of the FitzGerald family who came from Ireland to the western part of Prince Edward Island in the mid-1800's. Patrick states his reasons for writing this book in his introduction thus: "Being one of the youngest grandchildren in the FitzGerald family I grew up with no memory of my grandfather, Maurice FitzGerald, as he died five months before I was born. My grandmother, Gertrude MacLean FitzGerald died when I was fifteen. I only remember visiting her in the manor. Aunts and uncles were around to tell me about them, but when they started to die at young ages I felt that my family history was dying with them. That was when I decided to write this family history about the FitzGeralds to be passed on to others who would like to know a little more about where they came from." 1999 is the Tignish Bi-Centennial. Tignish's first settlers were Acadians, but shortly after 1800 came a number of Irish right from "the old country" who settled in Tignish and surrounding areas not far from present-day Tignish. The FitzGeralds belong to this later group. For people attending the Tignish Bi-Centennial Celebrations and who are of Irish descent, Patrick FitzGerald's book is an excellent source of information. Available At: Bookmark, Also Directly from its author below! A companion piece to Dr. George Dewar's "The Brothers Dewar", the story of the Dewar Family of Perthshire, Scotland and their new home in Prince Edward Island. The book addresses the factors behind the Dewar's emmigration, their life on the Island, and a genealogy of the families! This is a very interesting book, and has only very recently been released! Hardcover/Softcover - Limited # of Copies Available. This book was completed shortly before the death of J. Robert, and is the follow up to his earlier 1920's Mutch History, with updates to the present, and unlike the earlier version including the female lines. Author: Colonel John Brooks Devoe, M.A. This review is a synopsis of a longer one which appeared in the November 2000 issue of Le Reveil Acadien (Journal of the Acadian Cultural Society, Fitchburg, MA). The reviewer is the Society president and editor. In the estimation of this reviewer, Colonel Devoe's book is one of the better family histories to come along in quite a while, and I mean this sincerely, as one who sees, reads and consults a great many volumes of this genre. Great photographs, solid research, lots of maps and charts, well-documented genealogical information, clear references, easy reading all mark the 177 pages of this modest, unassuming book, which traces Colonel Devoe's paternal lineage in its many branches from 1691, when his ancestor Michel deVaux settled in Beaubassin, Acadia to the 20th Century at Little Bras d'Or, Nova Scotia, Colonel Devoe's immediate ancestral town. What more could one ask for in such a volume? As the author himself puts it, "this is a story of how they [his ancestors] survived; a story of faith, tenacity, and courage." And it really is! After reading this treasure of a work, one immediately realizes the many hours which have gone into its research and writing, and must truly appreciate all that is presented. To retell the history of a particular family in its proper context is indeed a difficult task, and yet Colonel John Brooks Devoe has succeeded in this endeavor, as he retraces the footsteps of each generation of his family tree within the context of Acadia's years of glory, tragedy, and "survivance." In addition, this book reflects upon the whole process of researching a family history. In it, one encounters the stonewalls as well as the bypaths which lead to unexpected discoveries. Within the paragraphs of its text, a window opens on a world familiar to our ancestors, with its daily chores and rigorous livelihood, and yet a world which is oftentimes foreign to us in the 21st Century, who are used to a plentitude of creature comforts, security, and relative ease. In the book, Colonel Devoe also gives a wealth of notes and asides, appendices on British Religious Intolerance, his Matrilineal connections, an encompassing Bibliography, and a supplement of potpourri items which include copies of letters, family photographs, and lots of additional information which only augments the text he has set before his family and all those who will read and learn from this volume. This reviewer can only commend the author on a job extremely well done, and urge others who are thinking of writing up their own family histories, to write for their own personal copy, so they may witness firsthand how a good family history should be written and pieced together. I am convinced that if you purchase a copy for yourself, you will agree. If you're planning on writing the history of your family, then you will want to purchase of a copy of this book. Dennis highly recommends it. Note: No longer available in 4 volume set, but on CD Rom, see below. Copies of the print version may show up in used book stores. La Société de généalogie de Québec has released an exceptional French language work, "Dictionnaire généalogique des Îles-de-la-Madeleine (1793-1948)", by Dennis Boudreau. This four volume work of more than 3900 pages covers the genealogies of Acadian, Canadian, French, English and Irish famlies with direct lines as well of Acadia, of Quebec and France. You will find the baptismal certificates, marriage and burials of Hâvre-Aubert (1793-1929), Hâvre-aux-Maisons (1824-1927), Étang-du-Nord/La Vernière (1840-1948), Bassin (1876-1939), Grande-Entrée (1900-1948), Grosse-Île (Anglican Registers 1858-1949), Miquelon (1763-1791), Hâvre Saint-Pierre (1865-1905), Amqui (1896-1990) and Lac-au-Saumon (1908-1990), also of Chéticamp, Margaree, and Arichat, Nova Scotia and Sandy Bay, Newfoundland. The work is supplemented by historical notes, a list of fishermen lost at sea and of Catholic and Anglican clergy. One will find genealogies of several famous characters: Sir Isaac Coffin, Richard Gridley, Sophia Paine (Loyalist), the Huet family of Pleudihen-sur Rance up to 1600. The presentation is in the form of small family groups, listings which are the most complete and most precise available for the Madeleine Islands. The author Dennis Boudreau is a Madeleine Islands descendant, living in the United States. He has devoted ten years to this work which has already been called one of the most significant contributions in the field of Acadian and Canadian genealogy. Price: $ 75.00 Canadian, $55.55 USD s/h incl. This CDROM contains the 3700 pages of the 4 volumes of the Dictionnaire (Contribution number 89) as well as a further supplement comprising 150 pages of revisions and updates, incorporated in the original document and 10 new pages in 2003. The Dictionnaire généalogique des familles des Iles-de-la-Madeleine links together the ancestors of the Islands to their Acadian counterparts found in Stephen A. White's Dictionnaire généalogique des familles acadiennes, as well as those of other origins, among whom are: Québecois, France-French, English (completely revised), Scottish, Irish, Native American, Italian, and Lebanese families, as well as further information on the descendants of the Islanders in the United States and Québec in particular, and it also includes much more information gleaned from the censuses, repertoires of marriages, and obituaries from the Québec and Maritime regions. Among other items, the CDROM contains full listings of those lost at sea, as well as information on the Islands' religious sisters and clergy (Catholic and Anglican). A history of the community of Summerside and its peoples. Chapters on the Bedeque-Malpeque Isthmus, Shipyards, Merchants, Community Life, Fox farming, and much more. An excellent value for the money! Also available through Bookmark in Charlottetown for $6.95 as well.